In this session, you will get an overview of how Microsoft User Experience Virtualization (UE–V) provides users a seamless experience as they move between machines by allowing them to roam their OS and application settings. 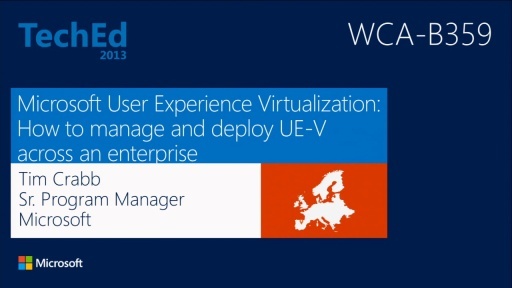 This session will introduce the tools to deploy and manage UE–V across an enterprise. Discussions will focus on how to setup and deploy UE–V, management of the UE–V agent via group policy, and also monitoring compliance of the agent and configuration with the configuration pack for System Center 2012 Configuration Manager.